Forums - Are the Betsy baffles serious loudspeakers ? Are the Betsy baffles serious loudspeakers ? I occasionally receive emails inquiring as to whether the Caintuck Audio Betsy baffles are "serious" loudspeakers. That's a very reasonable question for someone considering the purchase of an audio system ..... especially a person who is a "sincere but financially limited music lover". It is of note that the Betsy baffles are one of the seven speakers in the Stereo Times 2016 Most Wanted Components List. I found it somewhat amusing that when I had a demo room at the 2015 Capital Audio Fest there were several of the attendees who poked their heads in the door, saw my setup, chuckled under their breath and didn't bother to come in for a listen. It would certainly be easy enough to dismiss the Betsy baffles. They are not very big and not the last word in fit and finish. However ..... they make music ..... and they don't sound small. If a person is looking for the "wow factor" either visually or sonically, they probably won't cut it ..... but if a person is a genuine music lover, they just "get out of the way" and let the listener enjoy the musical performance. They certainly don't extend to frequencies beyond the range of human hearing or produce thunderous bass .... but the midrange is very nice and natural sounding, the top end has some sparkle and the bass to around 80 HZ is tight and tuneful. One of the things that has endeared these speakers to me is that I found quite a number of CDs in my library that I thought were really bad sounding via most of the loudspeakers I owned in the past ..... but I found the same CDs thoroughly enjoyable when played through the Betsy baffles. At the same time, CDs that I knew to be well recorded revealed things I had never heard on them in the past. I have also found that there is no shortage of "serious" audio equipment on the market that is impressive on the initial listening session, but listener fatigue often sets in and makes the listener want to cut the session short. This is usually not a problem with the Betsy baffles unless the recording is extremely hot or thin sounding. The fact that they work extremely well with any of the low powered Decware Zen amplifiers has resulted in a lot of happy music lovers with some money still remaining in their wallets. One of my audio buddies who passed away a couple of years ago once shared the thought with me that "if it sounds good, it IS good". He owned some very pricey audio gear during his lifetime ..... but also knew a good sounding "budget" component when he heard one. I'm pretty sure that he would have enjoyed a pair of Betsy baffles. Re: Are the Betsy baffles serious loudspeakers ? Hey Randy! It's The Other Randy. Haven't talked to you in a while, but I'd like to answer your (rhetorical) question about whether the Betsys are serious speakers or not. 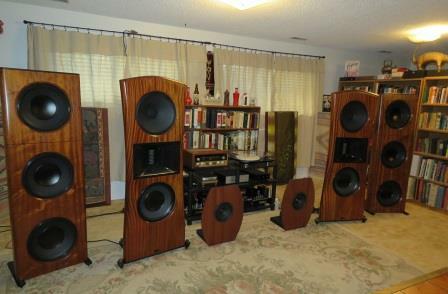 As you know, I have a pair of Hawthorne Audio Rainier MK II speakers, which retail @ $15,000. I bought them used, so I paid less than half that, but still...it was a chunk of change. Are they visually impressive? You bet. Are the Betsys their equal? Well, not quite. But it's a never-ending source of amazement to me how close the Betsys (boosted by a pair of Hawthorne Audio Augies on the bottom end) come to reproducing the sound of the Rainiers. I get a kick out of playing the Betsy/Augie combo next to the Rainiers (which aren't even hooked up) for people, and blowing them away. They are always bowled over by the sound, and ask me how much the speakers cost. I'm always tempted to tell them that I'll sell them the whole speaker system for $2,000, and watch them rush to get their money out. I have to explain to them that they aren't hearing the Rainiers; it's the Betsys and subwoofers that are playing, and at a fraction of the cost of the Rainiers. It's like the most fun that you can have for free. Our buddy George, who's system is featured in a Six Moons review has a similar situation.